Bees play a vital role in pollinating the fruits and flowers in our gardens, and every effort should be made to help slow the decline in numbers. What better way to do this than creating bee houses. Please see below for our bespoke bee houses that we build. Should you wish to purchase a bee house, please contact us through our contacts page to discuss the design and size of bee house you would like. As these bee houses are bespoke and individually hand crafted, please allow 10 working days for manufacture and delivery. Delivery charges are applicable. The images below are examples only and may differ slightly to the final product. Please note UK delivery only. A great subtle small bee box for your garden. These bee boxes work well as a cluster on a wall to add interest and would be good for Masonry solitary bees. 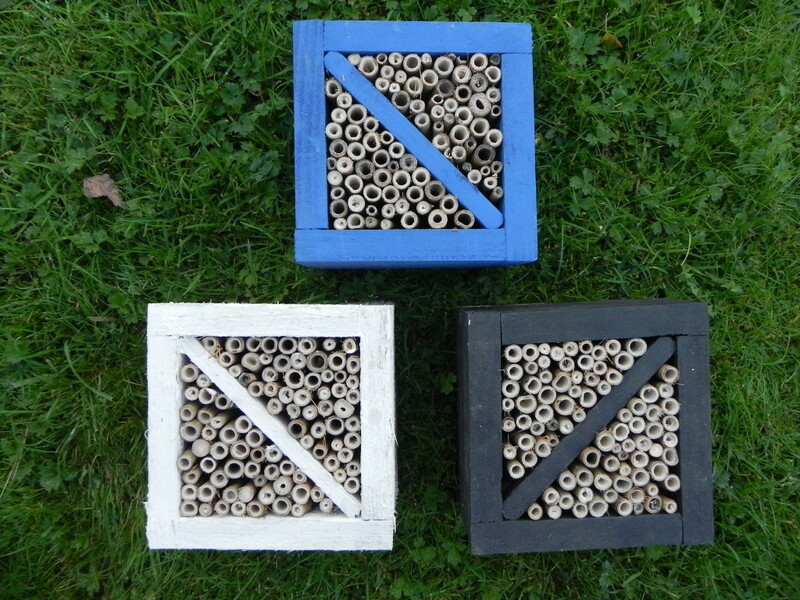 This simple bee box is very easy to install to a south facing wall. If installed in the correct time in the spring, it will only take weeks for residents to move in. Masonry bees would be the most likely species to use this bee box. A great subtle small bee box for your garden. 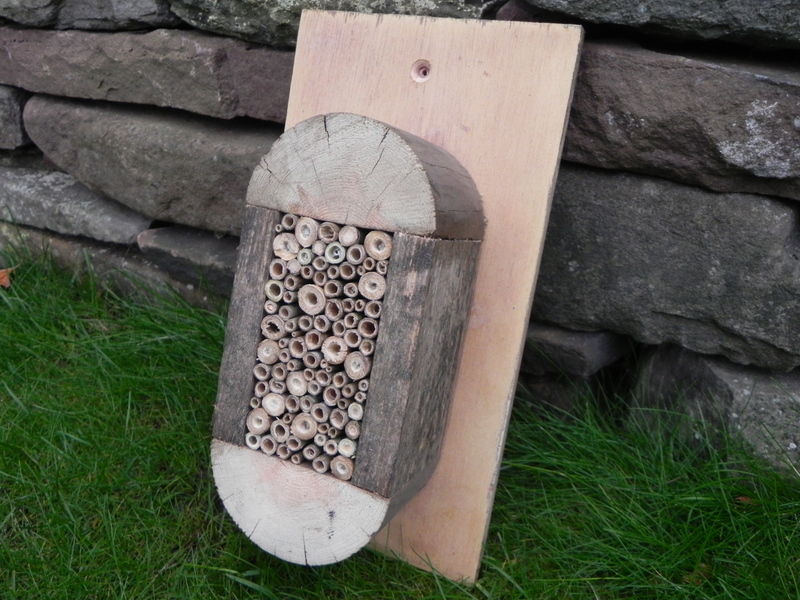 This bee box is a great introduction to encouraging solitary bees and insects to nest and reproduce. This simple bee box is very easy to install to a tree, fence post or wall. If installed in the correct time in the spring, it will only take weeks for residents to move in. Masonry and minor bees would be the most likely species to use this bee box. This bee box has a great striking appearance. 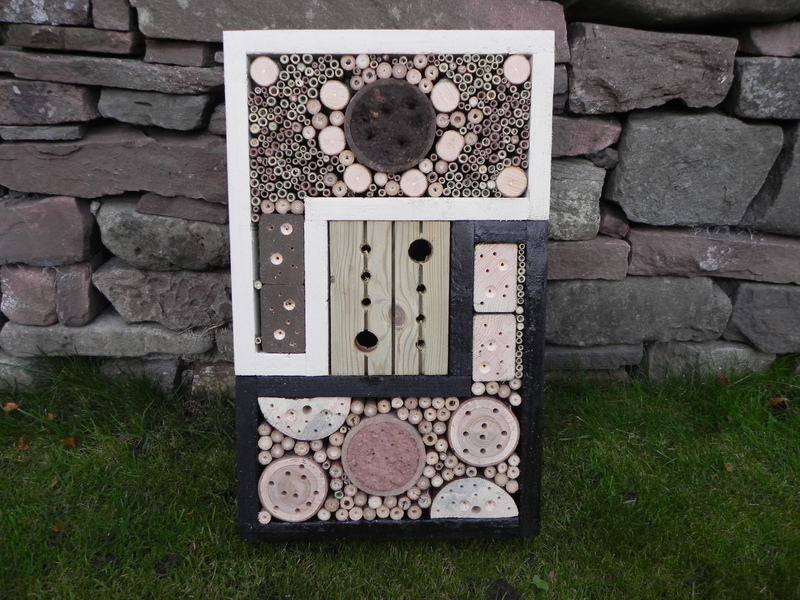 As well as providing a habitat for our bees and insects this box is also a beautiful piece of art for your garden. Masonry and leaf cutter bees are probably the most likely solitary bee species to use this bee house. This bee box is designed to encourage a range of solitary bees and insects. The central compartment has a chamber that many solitary insects like to explore. 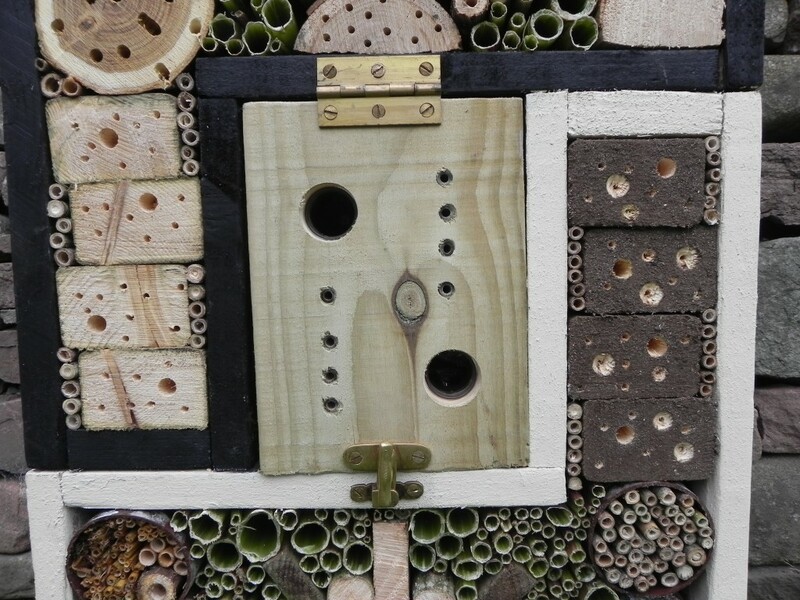 There are a range of materials such as clay, mud, bamboo tubes and wood to create diverse habitats for insects. Mounting strips are provided on the back of the bee box so that it can be fixed in the desired location. 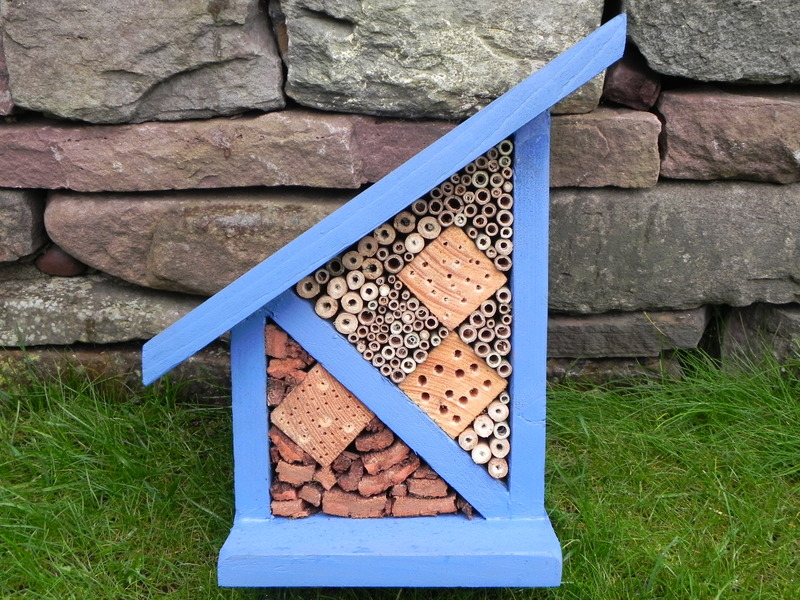 This is one of our more popular ranges as it is an eye catching bee box. This bee house contains two varieties of bark, wood, straw, bamboo, clay, sub soil, organic soil all aranged in a decorative fashion. Because of the large range of materials, it is quite normal to get a variety of solitary bee species that work in harmony. Remember to remove any occupied bamboo tubes and store in a warmer climate over the winter months which will increase the chances of hatching. 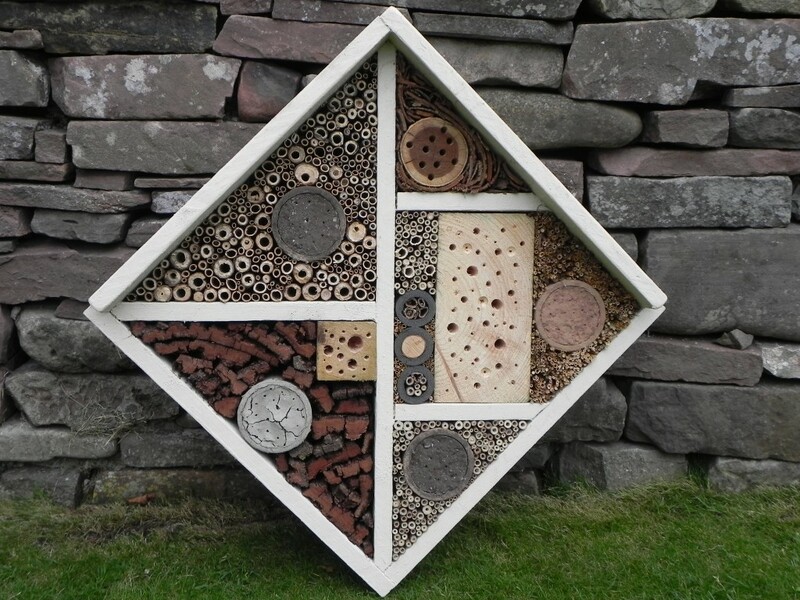 This is our largest bee and insect house that we produce again with a variety of materials to encourage a range of solitary bees and insects.The central compartment has a chamber that many solitary insects like to explore. There is a hinged lid that can be open to see the detailed tasks undertaken when a solitary bee is nesting. There are a range of materials such as clay, mud, bamboo tubes and wood to create diverse habitats for these insects.